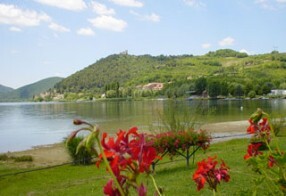 Piediluco is a picturesque town whose name means "at the foot of the montain". With its appearance which has remained unchanged since the Middle Ages, with its low, small and coloured houses, it is really dislocated in the narrow stretch of land which lies between the lake and the mountain. Lake Piediluco which takes its name from that of the town is so irregular in shape that it could be an Alpine lake. It is very charming, and surrounded wooded hills. Among these, "Echo Mountain", is distinctive because of its shape which resembles a large cone. This mountain owes its name to the fact that it is able to perfectly throw back a voice. The back of the village is dominated by the Castle (11th century). Although it is in part in ruins, it remains proud and impressive. Its strategic position often made it the object of disputes between the lords of the adjacent towns.The lake, where canoeing displays on a world-class level take place, is also a much frequented tourist resort, and offers the possibility of practicing various water sports. Every year the "Festa delle Acque" (Feast of the Waters), of ancient origin, during which it is possibile to see a nocturnal procession of decorated and illuminated boats, fire-works, concerts of classical music and theater spectacles.